Summary: Distraught that her academic career has stalled, Alba is walking through her hometown of Cambridge, England, when she finds herself in front of a house she’s never seen before, 11 Hope Street. A beautiful older woman named Peggy greets her and invites her to stay, on the house’s usual conditions: she has ninety-nine nights to turn her life around. With nothing left to lose, Alba takes a chance and moves in. Last year, I read a book that was a little outside my comfort zone. 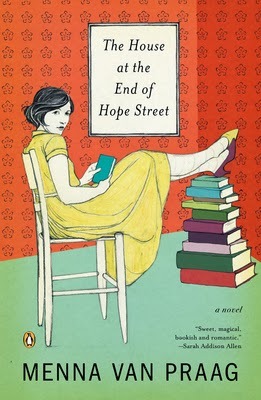 It was called THE HOUSE AT THE END OF HOPE STREET by Menna Van Praag. This novel definitely had it's fair share of magic which doesn't always work for me, but it was, most of all, a book about hope. I just loved so many of the messages and how it made me feel! You can read my review here. To celebrate the paperback release of THE HOUSE AT THE END OF HOPE STREET, I have a copy to share with one lucky reader courtesy of the publisher. To enter, just fill out the form below before March 20th at 11:59 p.m. EST. I will randomly select and notify the winner the following day. This contest is open to those of you with U.S. addresses only. Good luck! This looks really unique. Thanks for the giveaway. And I can't wait to hear what you think of Whistling Past the Graveyard. I've been wondering about that one.